Note: While this review will be spoiler free, it does assume you’ve read the previous books in the series. Change has come to the Half-Light City, and almost none of it is good. The Veiled Queen is dead, the treaty between the Night World and the humans broken, and everyone’s on edge, waiting for the first strike. The Templars have hired a mercenary army to aid their fight against the Blood and the Beasts, led by Captain Pellar. Also known as Asharic, the man who broke Bryony’s heart. Bryony’s spent the last thirty years living amongst the humans of the City, working as a healer and doing her best to forget Ash. The problem with that is her heart and her body didn’t get the message, and when he walks back into her life, they sit up and say yes please and thank you. 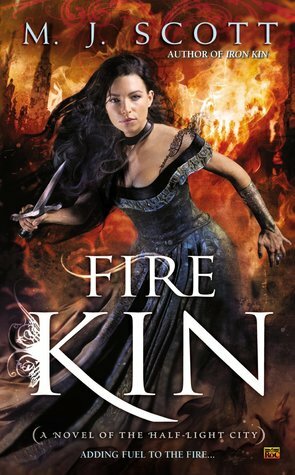 Start to finish, the Half-Light City series has become one of my favorite fantasy series, and Fire Kin is a great addition. The worldbuilding is as strong as ever, and because the hero and heroine are both Fae this time around, their little corner of it is fleshed out. There’s Court protocol and politics to learn, magicks and powers to control, and it’s all done with a detailed and deft hand. Bryony, who always came off as cool and rather reserved in the previous books, proves to be anything but when presented with the Fae who dared her to challenge conventions and misbehave. She’s stubborn, quick-witted, and has almost no defenses when it comes to Ash. Not that she’d ever tell him that. There’s more angst this installment than there’s been in the past, and it fits. Bryony and Ash were torn apart when Ash was exiled by the Veiled Queen, and Ash and his impulsive nature are partially to blame for it. While Bryony’s done her best to put it behind her, being around Ash brings to the surface all the things she once thought she’d have – and then lost. She’s still a little pissed at him for the pain he’s caused, and she’s not willing to let him back into her heart so easily. Ash has plenty on his plate even without trying to win back Bryony. Besides helping the Templars figure out when and where the next attack will happen, Ash himself is a target. The Fae have long, long memories, and his actions didn’t always endear him to the other Families. Someone, or possibly several someones, is determined that Ash will pay the price for what he did, as though his banishment weren’t punishment enough. This was actually one of the few things about Fire Kin that bothered me. We eventually find out why Ash was exiled, after it’s danced around in maddeningly vague terms for a good quarter of the book. But if there’s an explanation for what set in motion the events leading to his banishment, I must have missed it. I wish the climax had been more explosive, and that there’d been more tension in the build-up to it. The balance between the war the different factions had been waging for months and Ash’s path to redemption was a little uneven toward the end. But overall, I didn’t mind, because I was rooting for Ash to win it all: Bryony, acceptance by the Court, and his rightful place amongst the Fae. I don’t want to leave the Half-Light City behind, but if I have to, I’m glad it’s on a high note.